Please feel free to discuss the latest Humax Retail 31.56.10 software release in this discussion thread. This update is for T2000 devices. This update contains the new 'Start Again' feature for BBC programmes, Recent Searches along with some other improvements. It also includes the fix for the failed recordings issue which was experienced by a large number of users. There is no mention on this update about the failed recordings issue, will this update deal with that issue and if not why not and when will this happen? I have 2 youview boxes, the DTR 1010 which has been updated to address the failed recordings issue and a DTR 2000 where I have not yet seen an update notice to address the failed recordings, did I miss this? This update also has the recordings fix in it, we've now updated the comms to reflect this. Another great improvement to my YouView box. To be honest I was expecting more frequent improvements,but as they are all free I’m not really complaining! Hi, I've not received the update. I've tried to update manually and switched the box off and on. I'm still on 29.58.10. This is a phased update so not all boxes will receive the update at the same time. 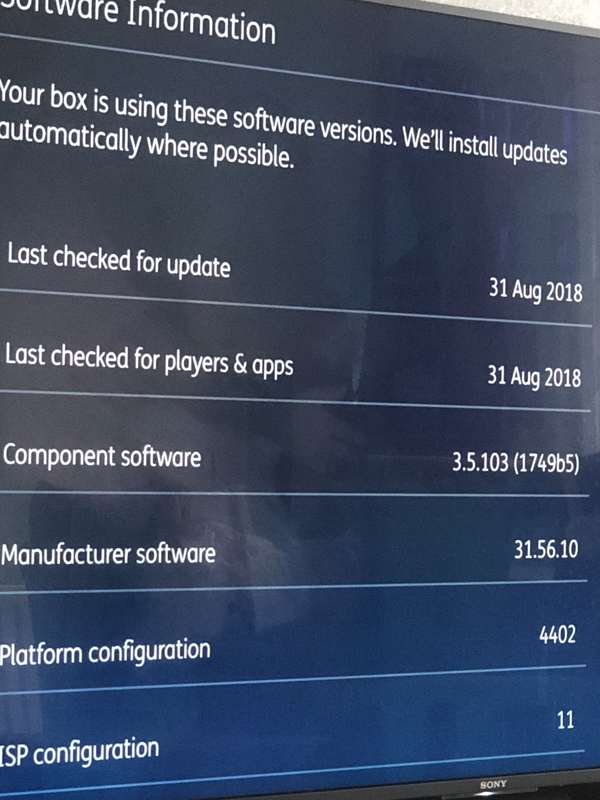 As this software release was only made available yesterday, you may need to wait a bit longer in order to receive it to your box but it'll be there soon Software updates usually take place overnight so you won't need to reset your box at all to receive the update itself. I have lost sound on my radio recordings. Timer indicates they are playing /ffing / pausing /restarting etc. This is ALL my radio recordings going back approx 1 yr including those I have listened to before with no problem. They are all Radio4 or 4 extra ie - voice of drama , comedy literature etc. -indepedently disconnected both tv and box mains and restarted. There is no problem with sound listening to tv or radio or tv recordings. The Standby button is the Power button, on/off button, call it what you will. Try that again but at the same time also disconnect the HDMI lead. On my similarly afflicted DTR-T2100 connecting with SCART only brings back radio playback sound reliably if the HDMI is also disconnected, RCA leads would be the same. Yes I know but Troubleshooting section specifically refers to the one "...on the box..." Where? the only one I can find , and therefore tried, is on the remote. Thanks Luke, didn't work. So I plugged the hdmi back in , there was what I'll describe as a 'thunk' as though something had dropped out / off and volume came back. Unsure of the source I disconnected RCA leads and volume remained. Can;t see / identify anything loose , so fingers crossed. Using your method presumably rules out doing anything simultaneous with the box? eg I usually listen to the Sunday play whilst scanning the epg and booking the coming week's recordings. I've just had a thought - I detached hdmi from the box only, In case of recurrence which end / ends do you detach? On the T2000, it is a little raised area on the far left of the fascia, under the word Humax. It lights up when you switch the box on. This is as known issue that I think is being worked on at the moment. @Sarah should be able to update you on this. Mean time you can catch up on what others have tried in this thread. I have noticed that since this update on 1st August my DTR2000 Humax YouView box has been continually accessing the internet in Smart Start mode and appears to be increasing my broadband usage. I understand that this may be normal behaviour in Smart Start mode, but it was never so constant previously when the box turned off and no programmes were being recorded or viewed. Has there been a change in the software in the recent upgrade which accounts for this behaviour? Is there any fix other than changing the power setting to Eco mode? Who's your ISP and what services do you subscribe to, rwsjr? YouView boxes have indeed got more chattery, but it started a few releases prior to 31.56.10, I believe. Are you on a metered internet connection such that this is a cost issue, or do you have other concerns with it, apart from noticing that it is happening? just stumbled on a work around - start playing recording , press power off on remote then power on. Now can't find the forum or it's posting to thank the supplier of this gem. Youview are aware of this problem but arent informing anybody. Even Humax support was unaware when it affected me last week. Hi, I swapped my BT retail for a Humax retail box. I am on EE broadband. It has up dated to this software HOWEVER the action panel in live tv, has no further details apart from the programme synopsis. On my Sony youview TV (not the box) I get more episodes. But this box does not have add to MYTV listed either in action centre. I have reset. Not sure what is happening. 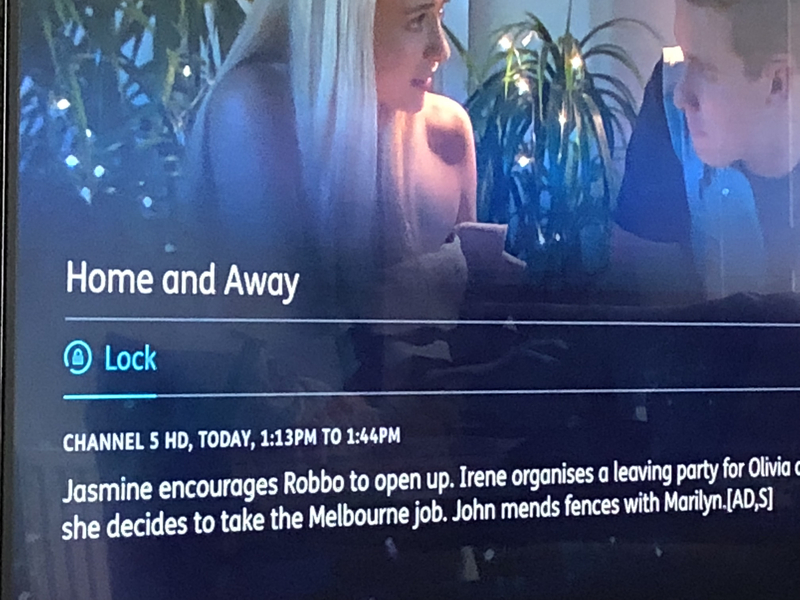 In the backwards guide when I press i, the opens are only for add to MYTV or on demand. no other episodes are listed. The Box came yesterday. Does the you view EPG need longer than 24 hours to come up with the other episodes Information? A search does bring up the extra on demand programmes. I am most grateful for the helpful community comments on "no sound on playback of radio programmes" after a recent YouView software update. I am astonished that YouView has not posted a prominent note about the problem, moreover it would appear that the software update was put through its paces before release. On my DTR-T2000, which suffered from this problem, I removed the HDMI cable; instead I fitted a SCART link, and I am delighted to report that the problem of loss of sound-only playback has been overcome - simply, quickly and effectively. In respect of ongoing software changes, I wonder too why, a couple of years ago or so, the presentation of available programmes in list form, which was clear and very effective, was replaced by a pictorial representation giving a mess of clutter on the screen, and which is ill-suited to radio channels in particular. If you have a Humax Retail T2000, it should have these options available for you. Information from the update containing Discover, Watch Lists and Action Panel can be found here. When you see a programme you want to save for later, you can press the red record button and this will save programme to MyTV. You can then go into your Watch List (within MyTV) and find the content you've saved. A lot of programmes will expire after a set amount of time depending on how long they're available to watch on demand for through the player. Are you able to use the record button to add programmes to your watch list? Not all programmes will have actions available in the action panel. BBC channels give the option to watch in HD if you're on the non-HD channel and will switch you to the HD channel when this is pressed. When in the guide you can also launch the channel to watch live from the info button. You can also launch available programmes on demand and add to MyTV from the info button/action panel. If you have none of these options available please let us know and we can then investigate further. in the action panel, when I press i on a live programs, I’m missing anything in the top bar on the panel. No on demand info or more episodes. However, in my tv or discover, if I press i, then I do get more actions in the panel. Does this happen on all programmes and channels you try this on? If you can provide some examples where this happens it'd be helpful for us to try and replicate. In discover further action panel options. Live tv or guide action panel no more episodes on any of the on demand providers. BBC channels give the option to watch in HD if you're on the non-HD channel and will switch you to the HD channel when this is pressed. This is not the most useful deployment of this technology though, is it? We need this facility when we are setting up recordings, and there is not a sniff of it there. The BBC deploy this technology Roy. For recordings this is expected behaviour, when watching a recording you will get the option to lock the recording so it cannot be deleted until it's unlocked (unless you do a factory reset). 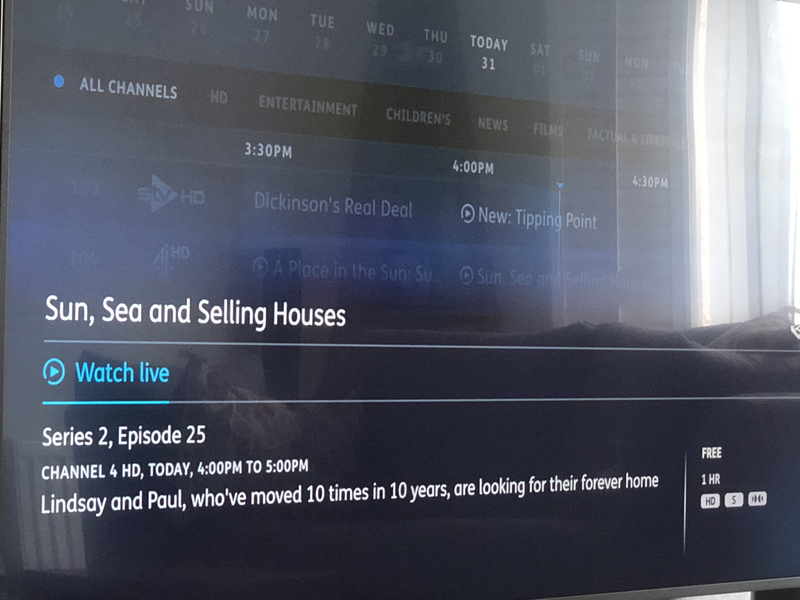 For Sun, Sea and Selling Houses, as it was on live when you were checking the guide, you only had the option of Watch Live which then launches the programme from the Action Panel. Now this programme has broadcast, you have the options to Watch on Demand and Add to MyTV. As not all programmes will show up in the player straight away after broadcasting, it can take a bit of time for the Add to MyTV and Watch on Demand options to show up in the Action Panel. The option to add to MyTV is currently only available for On Demand content. 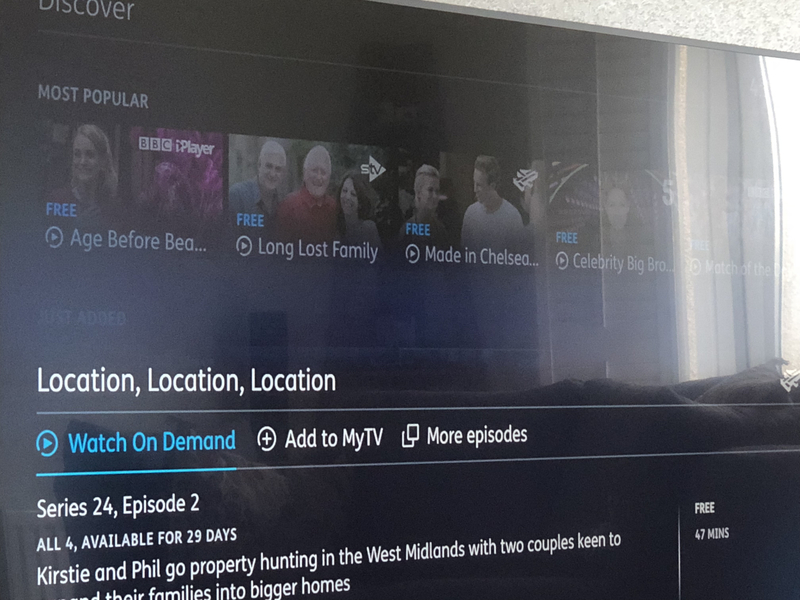 Discover will show you content which has already aired so the content there will be available for you to add to MyTV and also see any other episodes which are also available on demand. Discover and Watch List were launched together as they compliment one another in that you can look for content to watch in Discover and then add anything which takes your interest into your Watch List. There are generally more Action Panel options when the programme is not live than there are when they are live. I can find out if More Episodes is something which is supposed to show up on live, the Guide and in places like Discover or if it's currently just limited to Discover. Correction: In my comment of 30 August above read "update was not put through its paces" - unfortunately the word "not" was omitted.